Doesn’t matter who you were rooting for in the Super Bowl, you had to feel good about Drew Brees after the game, enjoying the moments with his wife and baby. 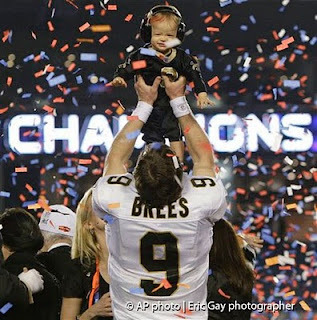 You can only imagine the emotions of having your first son and then having a Super Bowl victory one year and one month later. As they say, it doesn’t get much better than that. But the real story here, photographically speaking, was this amazing shot taken by AP photographer, Eric Gay. In a photo editor’s dream, you couldn’t ask for a more perfect shot. Let’s take a look at all the elements that make this work so well. Cropping. First, we see that the photo has undoubtedly been cropped. Purists would cry foul, but undoubtedly there was more confetti flying overhead or to the sides, and by cropping it to basically a square image, the focus is stronger on Drew and his son Baylen. Multiple shots. Confetti is flying everywhere, and speaking from experience, all you can do is shoot as many shots as quickly as possible so that the one you want doesn’t have confetti obscuring a person’s face. I don’t know how many Eric shot in that sequence, but chances are there were six or more for the editor to pick from. Prefocusing, in manual mode, is the only way to go with all that confetti flying. Leave it on autofocus and your lens will die trying to find something steady. And don't forget to wipe off you lens every couple seconds because confetti can land on your lens just as well as anywhere else. Position is the other major element that makes this work so well. Notice how Eric positioned himself so that whatever Drew Brees did, he would be able to have the big “CHAMPIONS” sign in the background? That comes from preplanning your shot. Attraction. The eye is attracted to the white in Drew’s jersey. Then you eyes follow the next brightest objects (his arms) up to the top of the frame, where your attention comes to rest on baby Baylen. Couldn’t work any better. This picture is worth 10,000 words in my estimation. Congratulations Eric, you’ve captured the feeling of the moment in 1/125 of a second.